Dallas is a regional city in Texas in the United States. All Dallas extends over 997.10 square kilometers in northeastern Texas, right on the Trinity River. The city of Dallas is gaining international popularity thanks to the eponymous American television series. Today, there are about 1.3 million people here. Weather and climate in Dallas are often unpredictable. Here is an area in which can often be seen raging tornadoes. Spring time cold air masses coming from Canada collide with warm moist masses that move from the Gulf of Mexico, in consequence of which, in Dallas are not infrequent storms with torrential rain, lightning and tornadoes. Founded on the Dallas oil fields in the 30s of the 20th century, allows the transformation of the city into one of the extraction and processing centers in the United States. Another well-developed industry growing in the recent past in Dallas is production and processing of cotton. Today in Dallas is a developed telecommunications center, in which a major sector of the economy are computer technologies. 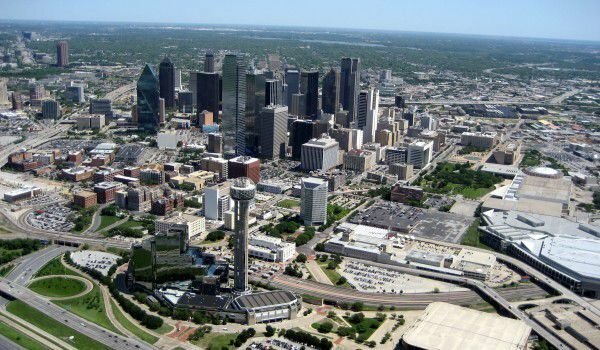 The central part of Dallas is surrounded by over 160 km of fiber for which the city is known as the "Silicon Prairie". History of Dallas started back in 1839 when John Neely Bryan, who was born in Tennessee and was a noble lawyer in town, came to the area of today's Dallas. The lawyer, who was adventurous, was impressed by the desert lands along the river. Bryan felt that here was an ideal place for development of trade. He returned to Tennessee to end his legal deeds and in 1841 bought 640 acres of land, outlined a municipal plan of 20 streets and paved the way for today's city of Dallas. 1960 was filled with turmoil for many cities in the U.S. and Dallas is no exception to this. Dallas will forever remain in the black history of the United States as the place of the November 22, 1963 President John F. Kennedy murder. Dallas has a special organization that deals with promoting the city as a preferred business center and a place for relaxation and pleasure. The northern zone of the central part of Dallas is known as Downtown and is a popular place for such art. Here are some of the best theaters in town. Among the cultural attractions of Dallas are the Museum of Art, Morton H. Meyerson Symphony Center. Quite interesting cultural site is The Trammell & Margaret Crow Collection of Asian Art, which visitors can see Downtown. Among the interesting places in Dallas area is a 15-meter high embankments on both sides of the Trinity River, which were built to provide protection from frequent flooding. White Rock Lake, located in eastern Dallas is another attraction. The area around it is a popular place for recreation and walking weekends. Here visitors have the opportunity to practice various outdoor sports such as rowing and sailing boats.